ANTHRO – 25% off Black Friday with code: SHOPTOIT. Valid til EOD. WEST ELM – 10% to 25% off based off spend with code: SURPRISE. Valid til EOD. 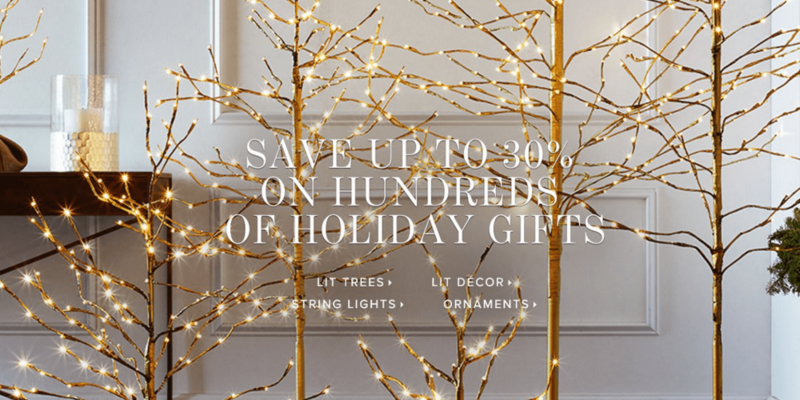 POTTERY BARN – 30% of holiday decor + free shipping with code: FREESHIP. Valid til EOD. RESTORATION HARDWARE – Save $100 for every $500 you spend with code: SAVE100. And enjoy up to 30% off holiday gifts. Valid til 12/1. REJUVENATION – Buy more save more (up to 25% off + free shipping.) Valid til EOD. CRATE & BARREL – 15% off + free shipping with code: SAVE15. Valid til EOD.